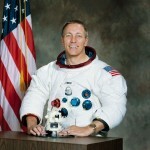 Full Name: John Leonard “Jack” Swigert, Jr.
1953-1956, after receiving flight training at Nellis AFB, Nevada assigned as a USAF fighter pilot in Japan & Korea. 1957-1960, Fighter Pilot, Massachusetts Air National Guard. 1960-1965, Fighter Pilot, Connecticut Air National Guard. 1957-1964, Engineering Test Pilot, Pratt and Whitney. 1970, originally the back-up CMP for Apollo 13, Swigert was made prime CMP after NASA flight surgeons determined that the original CMP Ken Mattingly may have contracted the measles. 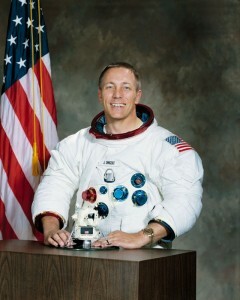 Flew his only space mission on the aborted moon landing attempt of Apollo 13. 1973, took a leave of abscence from NASA to serve as the Executive Director of the Committee on Science and Technology for the US House of Representatives. Retired from NASA & the Committee in August 1977 to enter private industry and, subsequently, politics. 1979, Vice-President, B.D.M. Corporation, Golden, Colorado. 1982, Elected to the US House of Representatives in November but died of cancer in Washington D.C. on December 27, 1982, before he could be sworn in. Portrayed by actor Kevin Bacon in the 1995 movie “Apollo 13”.